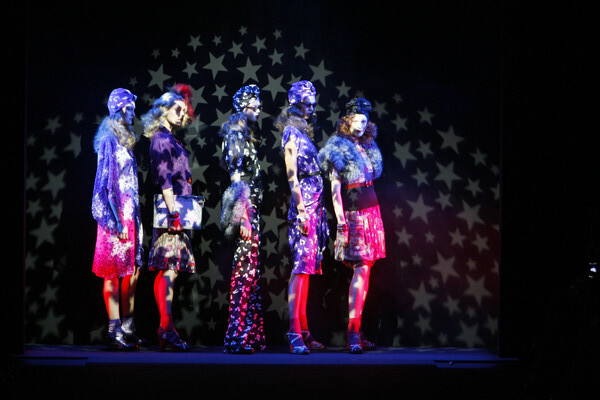 Antonio Lopez, an illustrator and photographer from the seventies, was Anna Sui’s big inspiration for spring/summer 2012. She got inspired by the way he introduced vintage fashion and disco music to Paris. The disco was translated to strong rock n roll colors (pink and red), the vintage could be seen in some soft creamy shades. They were mixed with bold graphic prints in all kinds of colors. Most of the designs were dresses, vintage looking ones in any kind of shape, mostly worn with a belt. The styling was over the top, very Anna Sui. The models wore turbans, sunglasses,chunky necklaces, headpieces, colorful socks and earrings, preferably all at once. There was so much to see, there must have been a cool fashion piece for just about every woman in the room. And when styled a little more subtle each item on it’s own will immediately become very wearable.